Tony Abbott & the Liberal National Party are facing their first real diplomatic challenge. In November 2013 shortly after the Opening of the 44th, Parliament. I commented on the charts of the swearing -in of Abbott on September 13th 2013, and the opening of the first session of the 44th, Australian lower house. I noted on my face -book stream the placement of Mars in both charts. 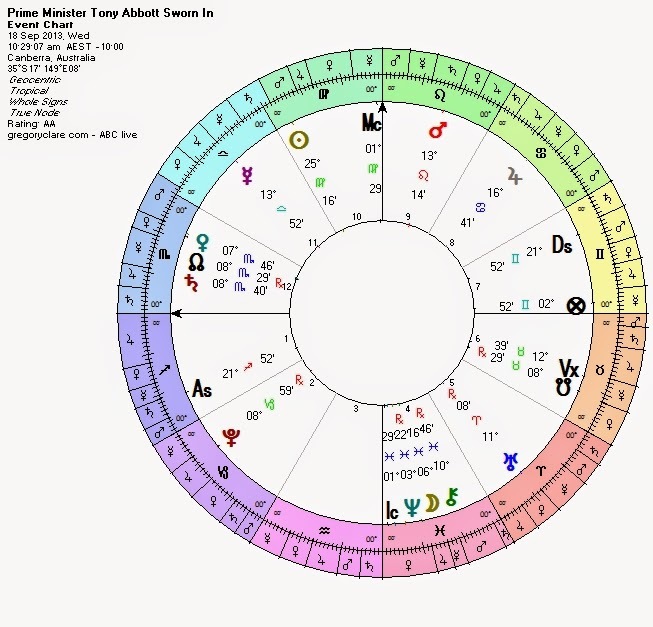 Mars in both whole sign charts is placed in the 9th house. The 9th house represents foreign affairs & our philosophical expressions. I made the suggestion that this would be a very difficult placement. Readdressing those comments in light of the recent sensitive events in Indonesia I would like to expand on these comments. In the first chart, Abbott's swearing -in, (18th September 2013 @ 10:29:07, AEST, Canberra, ACT.) Mars is placed in the 9th whole sign image (sign) of the Lion, Leo. The Lion doth roar! Mars is @ 13:14 degrees Leo. Mars is receiving a partile dexter sextile from Mercury in Libra, the dispositor Venus in the 12th house is co-joined to North Node/Saturn, in Scorpio squaring Mars. These aspects are very difficult - Mars essential nature from a Hellenistic articulation is said to be - separation/severance, dissociation/differentiation. This is accentuated when contra to Sect, as both Mars and Venus are. From a mundane expression Mars has association with, public affairs of a military, police, civil servants, public executioner, public prostitution and many other thorny & arduous affairs. Jupiter the planet associated with judicial distribution is at present transiting retrograde in Leo, it will transit RX over the natal Abbott swearing-in position on Friday March, 20th. I suspect that we will see some very (Lion) language exchanges in relation to the 9th house over the coming weeks. The placement in both charts also highlights another very much unnoticed aspect by many. The governments mundane general significator is the lord of the 10th house, as such the 9th is the 12th from the 10th, This shows those who are secretively plotting to bring us down as well as many other very difficult expressions. Mercury's role here is also very confrontational, he can be when contra to Sect, (as he is) discursive reasoning. Associations with accusation and disputation, contestation and destabilisation though verbal exchange. Mercury is lord of the 10th whole sign house, and he is also the lord of the natal Sun. The sun is the leader, in this case the leader of the nations parliament. Mercury is also the lord of the 9th house Mars in Virgo, in the Opening (12th November 2013, @ 10:41, AEDT, Canberra) of the 44th parliament chart. Over the coming weeks there will be as I have mentioned on my FB page some very choleric times ahead. These will be quite combustible. We can only hope that commonsense & empathy prevail. Mercury's function here is very pivotal, as he is also lord of the 7th house in Abbott's swearing chat. The 7th has two meaning here - as the 7th, it is our relations with others and a open expression of both parties. It is also an indicator of the reputation of the government, as it is the 10th from the 10th. The 7th house also contains the Lot of Fortune. Finally these issues will again resurface in late July early August. This time will also be very combustible for Abbott's leadership. It may well see him replaced. United States is entering a difficult negations period. Nuclear diplomacy is front and centre with Iran. And the US is playing a pivotal role delicately dealing with its allies. The Islamic Republic of Iran is relentlessly pursuing nuclear weapons with the express purpose of destroying the State of Israel,” said Netanyahu. Over the coming weeks transits to the US chart will trigger some real delicate moments. Oh how the political landscape changes - U might think that Uranus has something to do with these sudden changes? 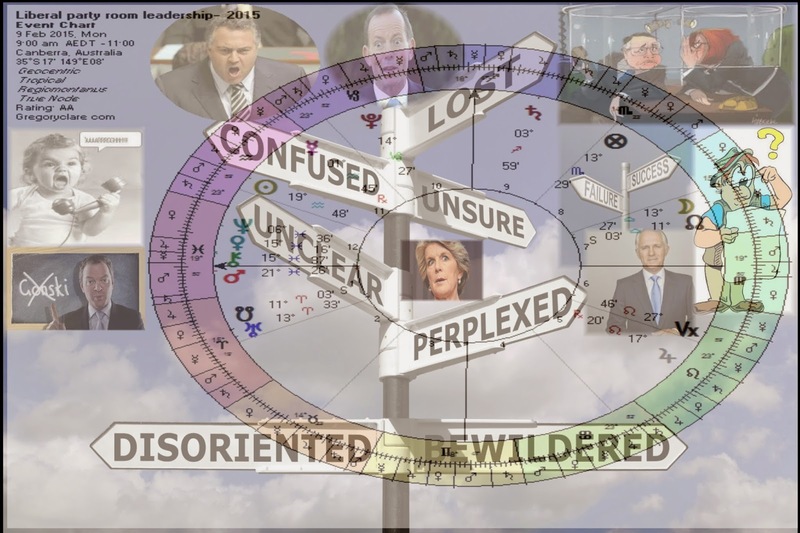 ?...Now the Liberal party room leadership- discussion, & vote is set for 09:00am, Canberra, ACT. Uranus in all probability does, however the trickster and the collector also move rather quickly, Selene -Moon, distributes, & blends the fundamental natures of the associations. So as mentioned in my earlier post, (which can be found on FB stream https://www.facebook.com/search/results/?q=Gregory+Clare&init=public) Qld election forecast - All candidates are shown by Mercury RX (Stationing) and RX Jupiter...so if you're looking for any kind of result this another very cool correspondence -correlation. Last weeks FB Posts -Friend me and I will respond to your request. So...U think there's no correspondence - correlation in astrology...ha..? he Architect of this ripening Moon - 14 degrees - Leo Full Moon - (Saturn) Leaders & Government may face challenges - !!! !